Mark Fitzpatrick is a highly respected, careful chronicler of nuclear proliferation. His monograph of A.Q. Khan’s activities is required reading. So, too, is his latest, Overcoming Pakistan’s Nuclear Dangers, in which he recommends that Pakistan be treated as a normal nuclear state if it facilitates the entry into force of the Comprehensive Test Ban Treaty, negotiation of the Fissile Material Cut-off Treaty, and helps reinforce other nuclear norms. 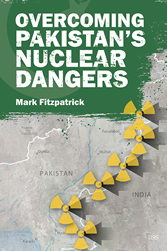 Mark correctly identifies an intensified nuclear competition on the subcontinent as a grave danger. He reasons that by bringing India and Pakistan into the existing nuclear order, dangers might be averted. He’s right. But will inducements succeed in persuading Pakistan (and India) to accept the limits inherent in signing up to the CTBT and FMCT? Pakistan’s official narrative is that of a reluctant, unwilling party to a nuclear competition with India. In reality, Pakistani leaders, civil as well as military, have viewed the Bomb as absolutely essential to maintain national sovereignty and territorial integrity. They rightly predicted that New Delhi would develop nuclear weapons and gain conventional military advantages, and countered by engaging in “anticipatory” proliferation. As Mark writes, “Pakistan assumed the worst about India’s intentions and spared no effort in preparing a nuclear counterpunch.” Zulfikar Ali Bhutto’s set the wheels in motion to acquire a nuclear deterrent two years before India’s first test of a nuclear device. Pakistan produced a deliverable nuclear warhead and possessed confidence in its reliability before India’s second round of tests. Today, Pakistan’s nuclear arsenal compares favorably to that of a neighbor whose economy is eight times bigger. Mark is tackling a significant problem that hasn’t climbed anywhere near the top of the New Delhi’s, Islamabad’s or Washington’s agenda. His book is timely because nuclear dangers will grow on the subcontinent as New Delhi applies itself far more seriously to nuclear matters in the years ahead. But I doubt that his inducements will look attractive to Pakistan — or India, for that matter. Sure, Pakistan would like to be re-branded as a normal nuclear state. But unless Pakistan’s anticipatory proliferation reflex changes, and unless its leaders demonstrate a sustained national commitment to reclaim the writ of the state against violent extremists, nuclear normalcy will elude Pakistan. New Delhi hasn’t shown much interest in helping Pakistan become a normal, nuclear state. Negotiations over confidence-building and nuclear risk reductions measures have been desultory, easily interrupted, and long delayed. Indian and Pakistani interlocutors do not view these measures as having intrinsic value. Instead, they are chips to be played for something more important. Pakistan won’t sign the CTBT and join an FMCT without India. New Delhi has already gained the Nuclear Suppliers Group’s seal of approval without having to sign the CTBT or suspend production of bomb-making material. Why would India help usher Pakistan into the club of responsible states possessing nuclear weapons if this means curtailing capabilities against a rising China? Defusing an arms competition requires choreographed efforts from the top-down as well as from the bottom up. Pakistan measures itself against India, while India measures itself against China. India will compete with China regardless of what Pakistan does. So, as long as Pakistan pegs its nuclear needs to what it anticipates India wants, inducements in return for treaties are unlikely to be successful. The FMCT may take years to materialize even after Pakistan lifts its veto on negotiations because both countries aren’t sure how big an arsenal they need. And the scenario providing the quickest path to the CTBT on the subcontinent (India resumes testing, followed by Pakistan, followed by signatures) would ratchet up the competition. India’s nuclear requirements haven’t diminished after being re-branded as a normal, responsible state possessing advanced nuclear technologies via the US-India civil-nuclear deal. This deal has not yet yielded the profits for US nuclear power companies or the geopolitical gains anticipated by its backers. US arms sales to India are up, which would be the case with or without the deal. New Delhi has remained on Moscow’s good side, as evident by India’s UN vote on Russia’s seizure of the Crimea, and will avoid choosing sides between Washington and China unless Beijing becomes belligerent. US-India ties should improve under a new Indian government, but the predicted benefits of re-branding India have so far been illusory. The arguments by backers of the civil-nuclear deal that it would be good for nonproliferation were fatuous. The deal enabled India to purchase uranium on global markets while refusing to place safeguards on no less than eight power plants as well as breeder programs. Pakistan’s anticipatory proliferation impulse kicked in once again, building a fourth plutonium production reactor and moving forward on other nuclear infrastructure projects. The dangers of deterrence and arms race stability on the subcontinent pre-dated the deal, but were compounded by it. A civil-nuclear deal for Pakistan isn’t in the cards for many reasons, including Pakistan’s inability to pay for nuclear power plants except at the concessionary prices offered by China. Would some other way to designate Pakistan as a normal state possessing nuclear weapons produce better results that the deal given to India? Many have tried to provide Pakistani leaders with inducements to take actions that were not perceived to be in their national security or political interests – and many have failed. If Rawalpindi were to conclude that it has sufficient nuclear capabilities to deter India, inducements might help — but they could also backfire, because those accepting favors will be accused of doing Washington’s bidding. Conversely, if Rawalpindi isn’t inclined to relax nuclear requirements, inducements will be wasted. The stewards of Pakistan’s nuclear program tell visitors that they intend to utilize sunk costs to implement planned requirements, perhaps through 2020. But this plateau could be a mirage, as requirements could continue to grow if stimulated by Indian ballistic missile defense programs or other technical advances. Pakistan’s leaders have a choice to make: they can seek normal, neighborly ties with India or continue to engage in a nuclear competition while accommodating extremist groups that target India. Pakistan cannot become a normal state that possesses nuclear weapons unless it has good neighborly relations, and Pakistan cannot become strong without a strong economy. Until Pakistan gets its house in order, economic growth will be constrained. These conclusions point in the direction of reclaiming the writ of the state against violent, extremist groups, vastly increasing cross-border trade, and seriously pursuing confidence-building and nuclear risk reduction measures with India. Pakistan cannot be at peace with India until it is at peace with itself. No nation can be considered normal when internal security threats grow alongside its nuclear arsenal. Here too, inducements won’t help; help can only come after Pakistani authorities make wise decisions. For Pakistan, nuclear normality begins at home; it’s not something that can be meaningfully bestowed by others. Well, it would imply that the military loosens its grip on Pakistan’s civil society. They use India and nuclear weapons as a pretext to rule the country and execute power. As it is, by trying to compete with India, Pakistan is ruining its economy and spending increasingly large sums to counter the myriad and multiple nuclear and conventional technologies India is developing. Further, securing and safeing these nuclear systems again comes at tremendous costs for the Pakistani state compared to India. With growing economic burden and technological shortcomings, Pakistan can at best only hope for consolatory strike against India in any nuclear war between the two and even then Pakistan would cease to exist as a nation even if they could severely cripple India with their nukes. In essence, from a logical standpoint Pakistan’s nuclear arsenal offers them no chance at a military victory, no chance of countering India’s conventional superiority or military assets and not even the guarantee of surviving a nuclear war with India should it come down to that. It only costs them money to keep, money to maintain and money to build delivery vehicles and warheads in ever increasing numbers to keep up with India’s nuclear and conventional military forces. in the grand scheme of things, how does being considered a “normal” nuclear weapons state, as opposed to just a NWS, make a bit of difference to Pakistan’s security? They did the work, they spent the time, effort and treasure, they were willing to eat grass if that’s what it took and they have reaped the reward of an effective nuclear deterrent. Whether some third party considers them a “normal” NWS or not seems an irrelevant distinction. Amazing statement! Height of hypocrisy. In other words if Pakistani terrorists do a sneak attack across the border and behead Indian soldiers, India should supply more soldiers for further beheading..
We Americans expected India to be our poodle while we continue to pump in several billion more dollars and more weaponry to Pakistan. We Americans will puruse “G-2 agenda” with China. You can choose not to post my comments ( which I expect) but what makes you think relations will improve with new Indian government? Strange notion since you have just refurbished your credentials as an untrustworthy overbearing bully. India is still very poor and should not antagonize the big bully, but that’s about it. Issue based, unemotional, rational transaction is what Indians should pursue.Not allies, not friends. Nothing more, nothing less. 2. To secure its nukes from falling in the hands of the terrorists. However, the above logic seem equally applicable to N Korea also … to make it feel more secure against an economic power house S Korea. Wonder, why the US do not provide N Korea, billions of dollars in military and economic aid … ! Would anyone care to explain … ? Especially if some of these ‘others’ you mention happened to pay for the nuclear program. Why would they want it dialed down? There is no doubt Pakistan is actually fighting a war against itself on its soil and is in in stability phase but this cannot be implied on the security of nuclear weapons which are hell safe and secured. International community must treat Pakistan as a normal nuclear state without making it to compromise over its national security interest.Further in the South Asian region and beyond that Pakistan has always tried to establish friendly relations with its neighbors and other countries of the international system but India has always been reluctant in solving the dispute and further relations with Pakistan. as a pretext for financial assistance – both to prevent the country from economic and political collapse. 3) Countries including Iraq, Libya and now Ukraine had fewer bargaining chips and were less problematic for external military actions. Pakistan is no doubt learning from their experience. Pakistani Taliban occupied Swat province within a hundred miles of Islamabad. Imagine a couple of tactical nukes in their hands……….. The most efficient way to bring these three in is to invite them into the NPT as nuclear weapons states. Under what terms and conditions this should take place, and by what timetable, are certainly topics for discussion. For the moment, multilateral discussions may be years away and are unlikely to happen, until China shows some serious interest. Hence, we have plenty of time to discuss what those conditions for admission should be. The bill also pushes back against the Obama administration’s proposed delay to a planned cruise-missile warhead modernization. The legislation would require the Energy Secretary “to deliver a first production unit for a nuclear warhead for the long-range standoff weapon not later than” 2025.